Chemical spills or leaks are always a possibility wherever they are used and stored. 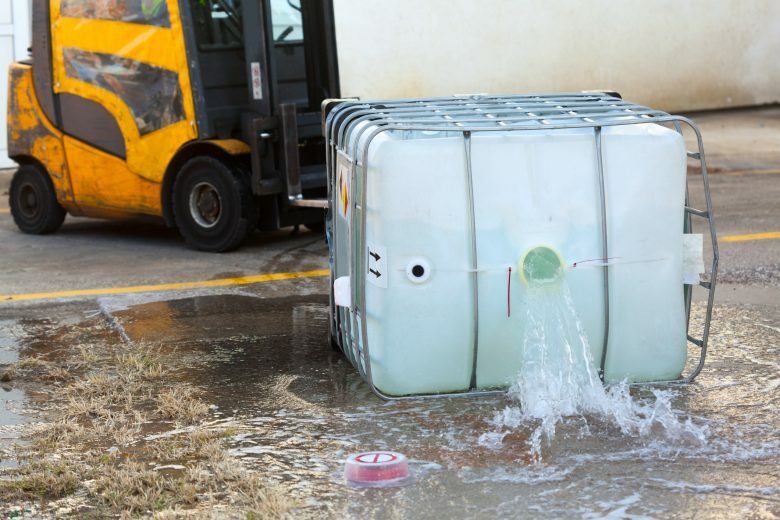 Drums that hold hazardous substances are not always leak-proof and chemicals can spill at any point during filling, shipping, unloading or storage. The appropriate procedures for handling drums depend on their contents and they should be visually inspected before any work is performed. OSHA has a relevant guide on all aspects of handling drums and other containers, but the big question is what additional steps can your workplace do to mitigate drum spills? For many organizations, the answer to that begins with a pallet. Because drums are usually stored on pallets, the best way to contain smaller leaks is to use a type of pallet that is capable of doing just that. Spill containment pallets are simple and designed specifically for catching chemical leaks or spills from drums. Assuming that the leak can be dealt with and the situation doesn’t require an evacuation, such pallets are the first line of defense in chemical spill containment. Spill containment pallets also reduce the workers’ need to rush or handle additional stress related to removing the leaking drum. These states of mind only make it more likely for a spill to be followed by a more serious incident, even if employees are wearing PPE. And rushing to maneuver a leaky drum can easily lead someone to forget about proper handling and safe lifting procedures. Drums filled with chemicals are heavy and a quick decision to muscle one around to prevent further damage could easily result in a back injury that lasts a lifetime. If a leaking drum cannot be moved without rupture, its contents can be transferred with a pump designed for this very scenario, while the leak stays contained and doesn’t spread. This means that the chemicals won’t cause slips and falls, fires or other hazards. This allows workers to slow down and concentrate on the job at hand without worrying about additional hazards. As a result, a simple pallet could influence your team’s reactions and lower the possibility of a leak escalating into something more dangerous. These pallets should be corrosion resistant and they are usually made of polyethylene, which means that they’re compatible with a wide range of chemicals. This same material is usually used to line drums, but if the lining is punctured then chemicals can easily corrode the outside of the drum and cause a leak. A good spill pallet won’t contain any other materials and, as such, would not corrode. Spill pallets vary in sizes but they usually meet spill control regulations for anything from one to eight drums. They also come in different designs, but their primary function is to prevent serious spills, which would be a huge help in the event of a large leak. In addition to containing dangerous spills, some pallets can also be linked to each other or stacked. The pallet’s strength is just as important as its containment capabilities, so when selecting a spill containment pallet this factor should be carefully considered. When looking to improve chemical spill management, safety professionals should keep in mind that supplementary materials like drain covers, spill berms and other equipment should also be used. And knowing how people react to and handle spills and drum failure will help justify any added expense in providing redundant engineering solutions because you’re not only protecting the environment from the spills—you’re also protecting workers from injuries that can occur in responding to them. It also gives you additional training points to cover in your chemical handling and clean-up processes.